What is the future of prosthesis? While the majority of research focuses on developing anthropomorphic prostheses, for example human-like hands, some novel ideas are emerging for alternatives that are going to be a lot stranger (and much more useful) than our current hands. We can expect a variety of attachments and remotely operated prostheses to emerge. 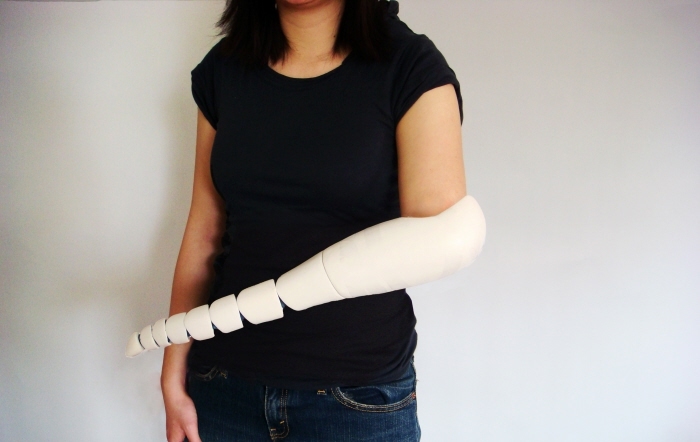 Kaylene Kau has developed an unusual concept for a prosthetic arm. The pictures essentially speak for themselves; she’s developed a concept for a tentacle prosthetic that can curl up and grab objects. Future nonanthropmorphic prosthetics will be developed for both aesthetic and utilitarian reasons and they will be controlled by thought similar to current anthropomorphic devices. Although they will initially be developed for people that have lost limbs or were born without them, eventually people will both replace and integrate their organic body parts with cybernetic and organic systems that offer these sorts of advanced features. The idea isn’t entirely novel. Prosthetics with changeable parts or interfaces for tools already exist allowing amputees to perform certain types of otherwise impossible work, and some devices have been patented in this area. Prosthetics can be created that allow for the attachment and use of tools in novel ways. Of course this is just the earliest days with unusual or special purpose prosthetics of this sort. In the near term we can expect various special purpose attachments, tools, and more to be implemented as prosthetic devices. Such enhancements would enable currently “disabled” individuals to perform work that “normal” people can not easily copy for example with nanoscale mechanical systems. Future emploers may require the use of prosthetic devices as these systems will allow individuals to perform work that would otherwise be impossible for them. For example, “compliant mechanisms” are a new class of computer controllable mechanisms which replace conventional rigid hinges by “compliant fixtures” or adopt the motion of “compliant components” rather than that of rigid ones to transmit or convert motion, force and energy. 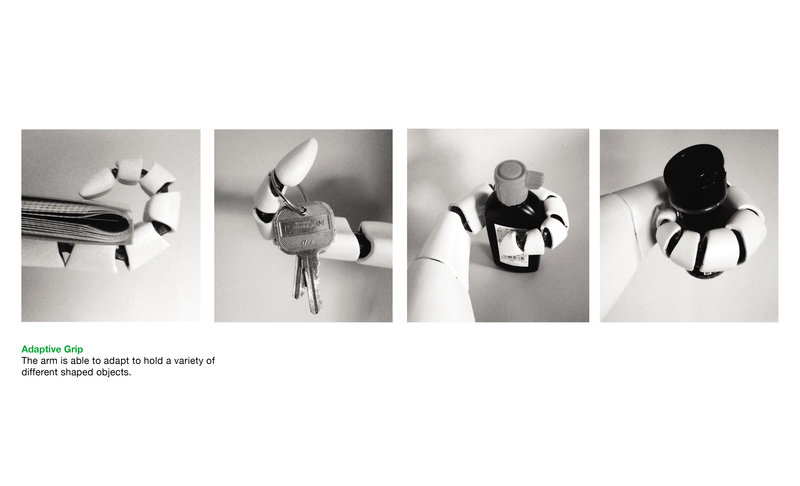 Compliant mechanisms are deformable, “morphable”, and change shape; they can do interesting things like fitting through surprisingly small spaces or varying their grips or other affordances. Hans Moravec proposed Bush Robots, which can also be considered as prosthetic devices. Yen-Wen Lu at Rutgers University and Chang-Jin Kim at the University of California have demonstrated a unique microscopic robot hand. The hand is so small that when clenched it measures just a little over 1 millimeter. The hand is made of silicon finger bones with balloons for joint that inflate and deflate to flex the fingers enabling someone controlling the hand to easily manipulate objects at this scale. The microhand has potential applications in defusing bombs and in performing micro-surgery. With the advent of affordable additive manufacturing and 3D printing, custom and one of a kind prosthetics will become affordable and available. In fact because of special needs of individuals these sorts of specialist engineers and craftsmen already exist. The man shown below with homebuilt prosthetic limbs makes custom prosthetics for other people. This image is from http://www.theatlantic.com/infocus/2012/10/scenes-from-21st-century-china-1/100391/ an incredible photo documentary of modern China. Check it out, wow. Is that a hand or a weapon? It might depend on what you do with it and it will be hard to decide in some cases. This will be problematic especially if a prosthetic is complex, reconfigurable, or “compliant” as shown above. The issue has already arisen in the crminal justice system. Mustafa Kamel Mustafa is awaiting trial on terrorism charges and has a prosthetic arm with a metal hook. The state is going to require Mustafa to accept a new set of prosthetics with rounded fingers that can’t be easily used as weapons. Of course the “gun hand” is a staple of video games, but the Lamprey prosthetic gun “turret” is the real thing, allowing amputees to compete in target and bench shooting, shoot “trap” and sporting clays, as well as hunt small & big game. What sort of hand would you design? Please comment below. I’m into martial arts, so something durable would be preferred. Perhaps with the addition of reinforced knuckles to increase impact force. The problem is not so much a new hand, but more hands. I have always wanted some smaller, perhaps even simpler hands in the middle of my chest to hold things while my main hands are busy. The permutations for cats cradle are incredible! A third arm would be quite beneficial. I have wanted one since childhood. In the next few decades that wish might become a reality.